Our Milwaukee bicycle accident attorneys have successfully handled all types of bicycle accidents over the past 45 years. Whether you are a recreational rider, amateur or professional cyclist, we have experience representing all types of cyclists. Bicycle accidents can have serious consequences for cyclists, which can lead to expensive medical bills and the destruction of property that you deserve compensation for. According to the last report from the Wisconsin DOT, one bicyclist was injured or killed every 10.2 hours. In Wisconsin during 2016, there were 918 crashes involved bicyclists and of these crashes, 11 bicyclists were killed and 849 were injured. According to the DOT, bicyclists are almost always injured in a collision involving a motor vehicle. Drivers of automobiles in Wisconsin must act responsibly when it comes to bikes and cyclists. They owe several duties to cyclists including the duty to look out, maintain appropriate speed, and to yield the right away. The laws that regulate motorists and cyclists are extensive in Wisconsin. Our law office has investigators that can quickly get involved and get evidence secured right away. When you’re injured in a bicycle accident, our bicycle accident injury attorneys will work to obtain all police reports and evidence and find out what happened and who is at fault for the bike accident. According to the Wisconsin Department of Transportation, bicycles are considered vehicles the same as a car, truck or any other vehicle on the road. Therefore, a cyclist has the same rights and responsibilities as a motorist. A bicyclist must obey the rules of the road like any other drive on the road and is required by cars and trucks to be treated as an equal user of the road. Because bicyclists are at greater risk of harm versus a vehicle, a motorist must pay particular attention to cyclists. Cyclists can also use caution on the road by wearing a proper helmet and beware that cars and trucks may not follow the rules of the road when it comes to bicyclists. A Milwaukee car accident attorney will tell you it is imperative to watch for bicyclists and to be aware of their rights in case of an accident. A helpful guide by the Wisconsin DOT about bicycle safety can be found here. A bicycle is considered a vehicle under Wisconsin law as long as it is a “vehicle propelled by the feet acting upon pedals and having wheels any two of which are not less than 14 inches in diameter.” However, a “bicycle” does not include very small two-wheeled bicycles, tricycles or motorized bicycle. Often, drivers feel the cyclists should not be on the road and ignore these duties. Other times, drivers may simply be negligent in failing to maintain their duties. When a driver’s negligence causes injury to a cyclist, often times it may be serious or even fatal. The Wisconsin Bike Fed is the country’s largest bicycle advocacy group and works to help pass laws to protect cyclists. More information helpful to cyclists about bicycle safety laws can be found on the Wisconsin Bike Fed website. 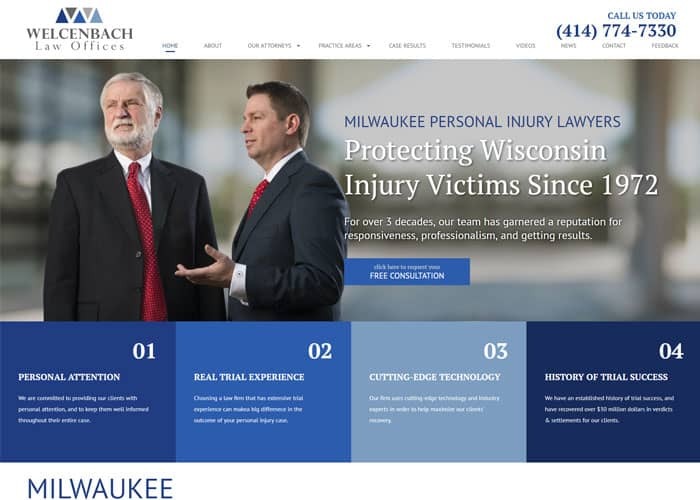 At Welcenbach Law, our Milwaukee Bicycle Accident Attorneys offer a free initial consultation and free legal advice to help you get your bike damage paid for. Our personal injury firm will help you deal with the insurance company to make sure you do not do anything or say anything that harms your case. We will negotiate with the insurance company to make sure your medical bills, pain and suffering, lost wages and other damages are compensated properly. The Milwaukee bicycle accident attorneys at Welcenbach Law Offices are avid bicyclists and have competed in numerous bike races and triathlons throughout the state of Wisconsin. Our bicycling experience helps us identify with you and to represent you in your lawsuit. We understand how vulnerable a bicyclist can be when car drivers fail to follow the rules of the road. Our Milwaukee bicycle accident attorneys have seen many car accidents that involve bicyclists. We have represented bicyclists for injuries ranging from simple road rash and broken wrists to injuries that resulted in wrongful death. No matter how complex your legal dilemma appears, the Milwaukee bicycle accident attorneys of Welcenbach Law Offices, S.C. can help. Contact us by e-mail or call us at (414) 774-7330 to schedule a free initial consultation. We offer convenient appointments at our law office, which is centrally located near Mayfair Mall. We handle all cases throughout Wisconsin and work with other attorneys Nationwide.